Due to tightening carbon emission regulations, wooden construction is now being promoted as an effective measure in the battle against climate change. Not only is the carbon footprint of a wooden building a lot smaller than of a concrete one, but the material itself also ties down atmospheric carbon dioxide given that new trees will replace the ones used for construction. The Finnish government has also made it public policy to develop and support wood-based construction. “Hallelujah!” shout the environmentalists. And for a good reason. As far as the urban-minded are concerned, the buzz on wood seems however to give little reason for celebration. Back in the day, just about everything in Finland was constructed out of wood. Stone-built churches were basically the only exceptions. Wood was obviously the most convenient material to use thanks to its universal availability. Our ancestors evolved to master the skill of wooden construction leaving a legacy of stunningly beautiful urban habitats. The Old Town in Rauma is for example now a UNESCO world heritage site. The narrow streets of Old Porvoo have an extraordinary urban appeal. In Helsinki, I recommend taking a walk in Puu-Vallila and Käpylä for a taste of how a small-town neighborhood looked like 100 years ago. I would argue that the majority of Finns still associate wooden construction to be a part of our identity. A wooden house in Käpylä. Photo courtesy of Suomalainen design, muoti ja arkkitehtuuri blog. One of the narrow streets in Old Porvoo. Photo courtesy of the city. Old Rauma. Photo courtesy of Visitfinland.com. More Old Rauma. Photo courtesy of Eetu Laankoski. Panorama of Old Porvoo. Photo courtesy of the city of Porvoo. But regardless of the importance of wood to us, we threw it all away after WWII along with other urban traditions. And it wasn’t that we only stopped building traditional wooden neighborhoods, we also destroyed almost all the existing ones to make room for modern concrete buildings. The result is that the skills of designing great wooden cities have long ago sunk to oblivion. The modern era wooden houses mainly consist of detached homes made from prefabricated components. 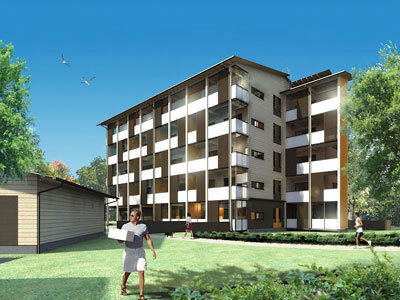 A modern multistory wooden apartment building. Picture courtesy of Vuorelma Arkkitehdit Oy. Our newly found interest in wood has no connection with an interest of changing any of this. It’s as engineer-oriented as all the post-WWII urban development. The new wooden multistory apartment buildings look just like their concrete counterparts. And it’s not only their design. In many cases especially the interiors of buildings would be difficult to distinguish as belonging to a wooden construction. Apart from a handful of post-modern landmark buildings, there generally seems to be little interest in highlighting the construction material. 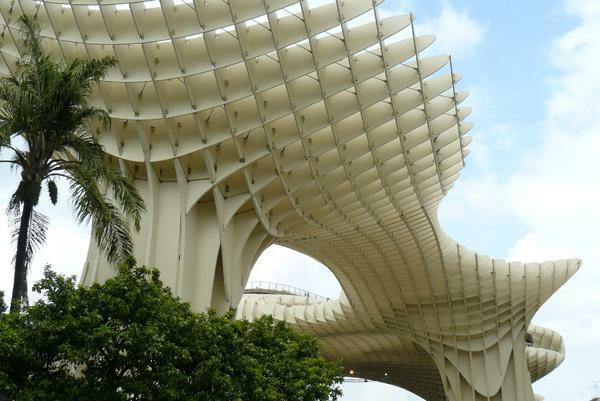 Metropol Parasol; display of Finnish wooden construction in Seville. Photo courtesy of Metsä Wood. At one of the seminars, someone enthusiastically announced that modern wood-construction technology has now tackled the last barriers for being able to suit all needs leaving imagination as the only remaining limit. Wood is a viable option for building material what ever it is you plan to create. A number of projects from around the world truly favor the argument. The key problem just is that our imagination is the most insurmountable barrier. If only we could design today’s wooden neighborhoods with the same passion and vision as we still did a century ago. Isn´t the 5th little picture from Puu-Vallila, not from Käpylä? Hey Joel! Much appreciated. And now that you mentioned it, yes, I’ve uploaded the wrong picture. The gallery interface on WordPress is so complicated…I’ll fix that soon enough!